Whether you voted to leave or remain part of the EU in June’s referendum, we hope you agree that, when it comes to science, our involvement in EU research programmes is vital. Whatever form Brexit takes, losing access to them would be a huge blow to collaboration, funding, and maintaining the UK’s world-leading position in science. There are more details below about what each of these calls involves, and why they’re important. Already convinced? Get involved by heading over to our EU Campaign page and find out what to do! EU funding makes it much easier for groups of researchers in different countries to collaborate on projects. They are one of the few sources from which multinational collaborations can be funded on the same grant, meaning that all partners can be assured of funding if the application is successful. Even if the government pledged to make up the loss in funding on leaving the EU, the current system of funding through Research Councils and universities would not be able to replace the vital collaborative functions of EU funding. Further, the continuing large uncertainties around EU membership and large drop in the value of the pound are already making the UK a less attractive place for EU researchers. Freedom of movement makes it dramatically easier to recruit the top researchers, wherever they are in the EU, which is vital in the increasingly specialised and competitive world of science. It also significantly simplifies matters for UK scientists seeking to make a career elsewhere in Europe, or go abroad for a short time to make new contacts or learn new skills and techniques. Indeed, the freedom granted to UK citizens is often neglected in discussions around migration. Many individual researchers and labs have experience either moving outside Europe or recruiting researchers from non-EU countries, and will be familiar with the bureaucracy and expense associated with obtaining visas and work permits. In science as in many other fields, we need to make it easier to hire from a diverse pool of talent; losing freedom of movement to and from EU countries would only make it more difficult. It is important to emphasise that the benefits of EU research programmes are not restricted to funding—although this is a central point. 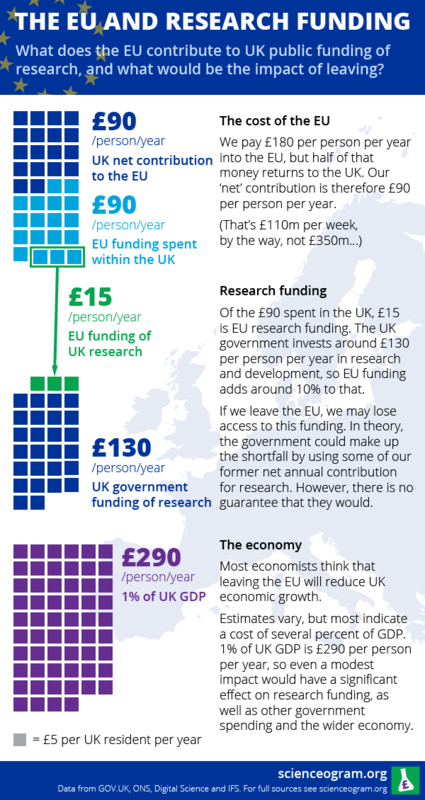 At present, around 10% of public funded research is supported by the EU. It is therefore a huge component of the UK science funding ecosystem. Further, the UK is a net winner in terms of EU research funding, with British scientists winning more in EU grants than our contribution to the research budget. The financial side of things is summarised in this infographic by Scienceogram from before the referendum. As ever, full details and sources are available on their website. The government has currently pledged to honour grants won before the UK leaves the EU. This is a positive step, but does not provide the long-term stability required for researchers thinking of complex projects involving many collaborators, or their own research careers. The Government’s recent announcement of an extra £2bn for science in the 2016 Autumn Statement is a positive step. But, as you can read in our blog from the time, it could almost be cancelled out in cash terms from losing access to EU research funding, and the damage to collaborations already mentioned could mean the overall impact is greater than the new cash. We’re running a campaign making the case for EU research programmes. Give UK research a festive gift by writing to your MP and inviting them to our lobby in Parliament, and joining them if you can: Click here for details. 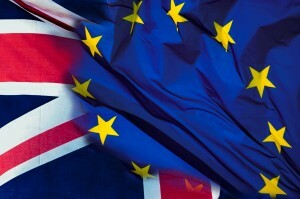 The House of Commons Science and Technology Select Committee, a group of MPs who scrutinise the Government’s policies on research, recently released a report on Brexit. See the summary on our blog, or read the full report to find out more.